More than a simple gun or revolver, it can be considered an artwork. This pepper-box revolver, made in Bilbao by Paulino de Aretio (probably at the end of the XIX century) is decorated with golden and silvered details, and make out of it a museum-like piece. The starting price was settled at 18.000 USD, but it is expected that the bids will go up to 30.000 USD. 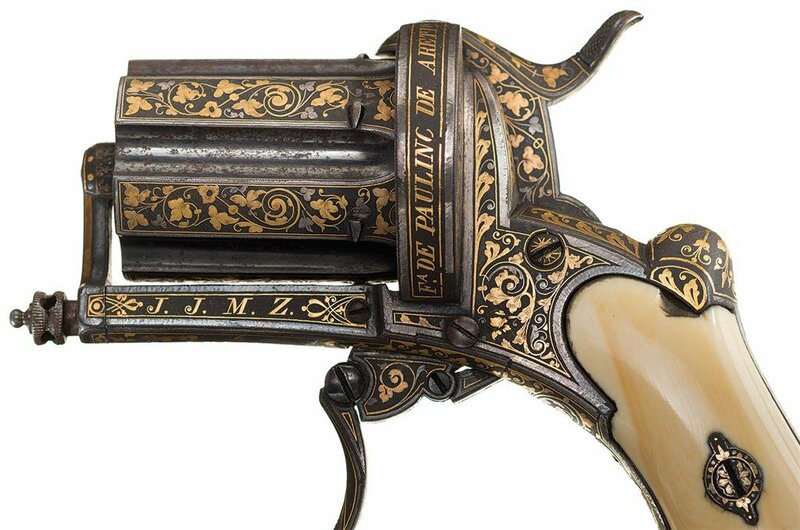 The revolver has exquisite inlays of gold and silver, representing some leaves and foliage. This inlays cover most of the matte black background of the gun. A grapevine and patterns of leaves cover the cylinders, frame, recoil shields, loading gate, hammer, folding trigger, and the grip straps. Golden inlays of “JJMZ” can be found at both sides of the double action pinfired revolver. The same initials are printed with silver in the wooden box where the revolver is showed to the public, giving it a museum-like presentation. It is also signed by the manufacturer. One of the edges of the recoil shield contains golden inlays of “Fade Paulino de Aretio”, whereas the loading gate says “Bilbao”, printed in the yellowish precious metal. We have tried to come up with a reference of a gun manufacturer named Paulino de Aretio, but we haven’t found such reference. However, we have come across a gunsmith from Eibar called Paulino Areitio, who was active during the last third of the XIX century; and a second gunsmith from Vitoria-Gasteiz named Bartolome Areitio, who was also active in the second half of the XIX century and was specialized in damascened cannons. Thanks to the aportation of a reader, now we know a little bit more about the topic. He’s sent us a PDF document with the title “Yearbook of the trade, industry, magistracy and administration. 1886, nº 52” dedicated to Biscay (BIzkaia). 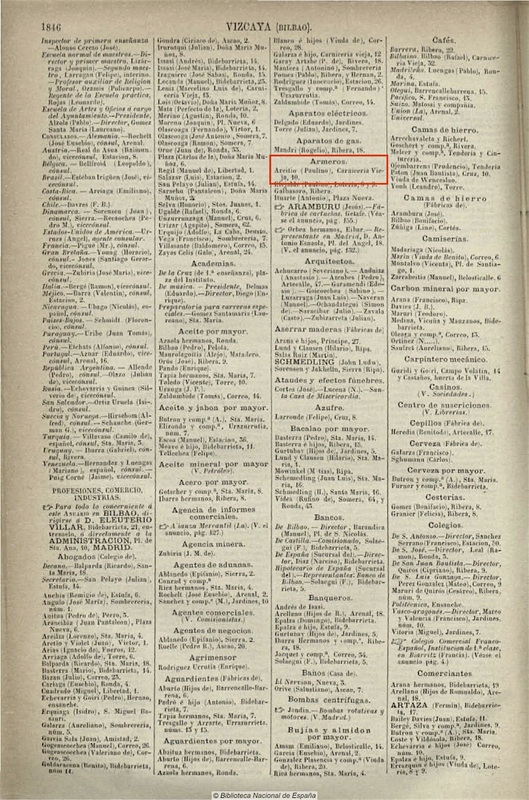 In the second page, which we contain here, it is reported the existence of a gunsmith with such name, whose workshop was located near the Old Butcher’s in Bilbao’s Old Town. It is probable, or at least we think so, that it could be a familiar saga that spread all over the Basque Country. However, we haven’t been able to find any references to a “branch” from Bilbao, and the inlays of the weapon suggest there must me someone related to this Basque city. Anyway, it is amazing to find out such a spectacular artwork, that apart from having a defensive/offensive function, it had a social value that gave prestige to the owner. By now, it has become one of the most wished collector’s item offered by Rock Island Auction Company. This antique pistol would make any vaquero proud. It’s a double action pinfired, pepperbox revolver, manufactured by Paulino Aretio of Bilbao Spain, and up for auction. 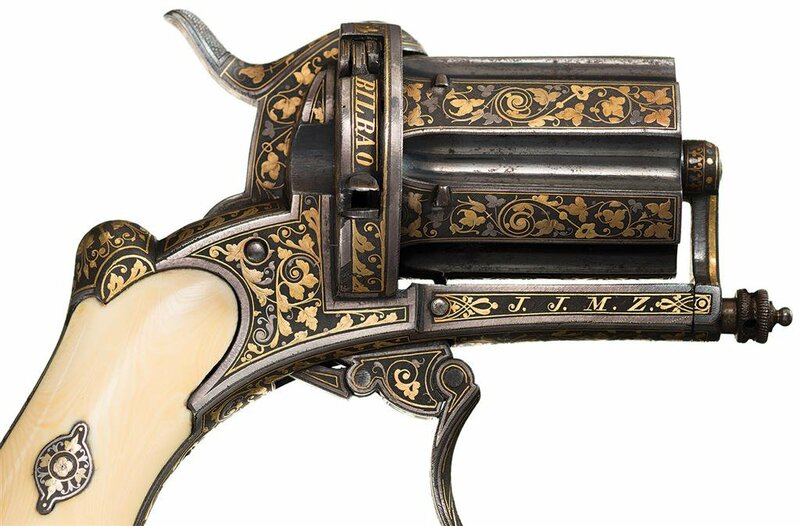 The gun features an exquisite silver and gold inlaid foliage design. The inlay covers nearly all of the metal surfaces on a matte black background. A vine and leaf pattern cover the cylinder flats, frame, recoil shields, loading gate, hammer, folding trigger, and grip straps. The sides for the frame have “J.J.M.Z.” inlaid in gold. The same initials appear in silver, engraved on the wooden box that showcases this museum-quality gun. It’s also branded by the maker. The edge of the left recoil shield has “FaDE PAULINO DE ARETIO” inlaid on gold and the edge of the loading gate (right side) has “BILBAO” inlaid in gold. This double action pinfire revolver, manufactured by Paulino Aretio of Bilbao Spain, features an exquisite silver and gold inlaid foliate motif. The inlaid foliate covers nearly all of the metal surfaces on a matte black background. The vine and leaf pattern cover the cylinder flats, frame, recoil shields, loading gate, hammer, folding trigger, and grip straps. The sides for the frame have “J.J.M.Z.” inlaid in gold. The edge of the left recoil shield has “FaDE PAULINO DE ARETIO” inlaid on gold and the edge of the loading gate (right side) has “BILBAO” inlaid in gold.